When it comes to cocktails, we are margarita people. You know it’s the weekend when you walk into our kitchen and see the small mountain of juiced lime halves on the counter. Life is too short to use the neon green stuff from a bottle so we pooled our fun money to buy an electric citrus juicer a couple of years ago. My manicure no longer weeps at the thought of juicing all those limes by hands. And we put a second dwarf lime tree in the backyard. Yes, we are definitely margarita people. While we do love a good traditional margarita, the Grapefruit Margarita is actually our favorite. It’s refreshing, tart, and fun. It came about like many other things around here, a product of hoarding, desperation, poor planning 🙂 It’s hard not to buy too many grapefruit during grapefruit season! Tequila – use your favorite. We’re pretty much “margarita tequila” people (the days of drinking it straight are long gone!) so we usually buy Sauza Hornitos Reposado or Hornitos Plata. Our next bottle will be an organic, Texas-made tequila – I hope it lives up to my expectations. Orange liqueur – while we usually have Grand Marnier in the pantry, we’re really digging a new find: Paula’s Texas Orange. I bought it because it had the word “Texas” on the label. And it’s worked out beautifully. Grapefruit – There’s no better grapefruit than a sweet, juicy Texas Rio Star grapefruit. And when it’s grapefruit season, you can score an 18lb bag for $5 at my grocery store. When these last 5 grapefruit are gone from the bowl, we’ll have gone through 36 lbs since January. That’s a lot of Grapefruit Margaritas! 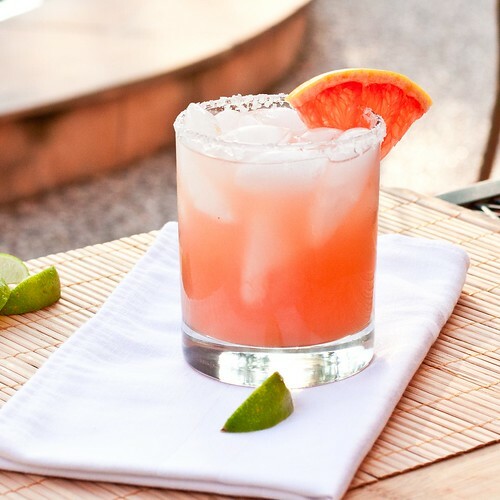 Fresh ruby red grapefruit juice and lime juice make the ultimate grapefruit margarita. Mix tequila, orange liqueur, lime, and grapefruit juices well. If you think you need a little more sweetness, add a splash of simple syrup. Rub one of the used lime or grapefruit rinds around the rim of two glasses and dip in cocktail salt. Fill each glass with ice and pour in the margarita. What a delicious and refreshing drink! Margaritas are my absolute fave! I can’t wait to try this recipe! Thanks for sharing. I love margaritas with Grand Marnier! How does Paula’s Texas Orange compare in price? @Laura, We paid ~$25 for a 750ml bottle. I can’t remember exactly how much GM was, but I know it was over $30/35. Not enough margaritas get made in this apartment, which is what I have realized after reading this post. Especially not enough grapefruit margaritas. given that this is my favorite citrus…I think this has to be reconciled. Immediately. I am by no means a margarita girl, nor one who can manage to drink anything that’s come within ten feet of hard alcohol without gagging and scrunching my nose, but I’ve come to feel that grapefruit makes anything better. I might have to take off my arm floaties for this one! Delicious~ I absolutely adore margaritas, anything tart is my thing. I cannot wait to try these. Grapefruit margaritas are our favorite and were our signature cocktail at our wedding reception 2 years ago. Love them! Thanks for another wonderful recipe! Now I’m wondering if the grapefruit margarita would translate well to your margarita cupcake recipe. YUM!! You’ve combined 2 of my favorite things: grapefruit juice and margaritas. I will definitely be making these! I’ve been craving grapefruit like crazy. Must hit the liquor store soon to make these! Pic is gorgeous too! This appeared in my google reader right alongside Elly’s chicken taco burgers, and my first thought was that they’d make a great pair! I am quite literally salivating at the picture and idea of this drink! One question – what on earth is a Texas Star grapefruit? Not a variety I’ve seen here in Australia, but judging by the colour of the drink, a sort of ruby grapefruit? I am such a sucker for margaritas… and this one looks sooo great! I can attest that these are great! Definitely my new favorite margarita (although I confess I tweak the ratios a bit to fit my personal preference). Wow, these look amazing! It’s sunny but not warm in MD right now and these have me dreaming about 80 degree days. Beautiful photo, too. I don’t drink margaritas that often but this version just might make me. I am slightly obsessed with margaritas, I love them, they are my cocktail of choice, when I was pregnant I missed them. I have made many, many variations but I have never thought about making them with grapefruit juice. I am going to have to make these soon. Fantastic! I have a bowl of grapefruits just waiting to be made into margaritas! Thanks for the wonderful idea! I absolutely love Margaritas; they just seem so summery and refreshing. I am definitely going to try this one, but could you also devote a post to your regular margarita? I have yet to find a homemade version I enjoy, even though it seems like such a simple concoction. Thank you for this! I cannot stand the flavor of a grapefruit alone, but something about the way it mixes with the tequila makes it magical to me! Thank you so much for posting this. I came home from college spring break with grapefruits and your drink sounded much better than the slushy mix and tequila my roommates have. I couldn’t wait to try it (but had to), and it was every bit as delicious as I had hoped. Maybe because I skimped a little on liquor amounts (newbie mixer), but I needed neither sweetener nor salt for mine. Definitely one of my summer drinks now. I like mine with salt and on the rocks…and DEFINITELY no mix! Ugh. The thought of it makes me cringe. I love the grapefruit addition — I’m sure the sweet and tart flavor is amazing on nice! Thanks for sharing. I’m so excited to try these out! Can’t believe I’ve never thought of mixing up the citrus in a margarita (other than the time we had lots of meyer lemons and no limes…that was actually great). 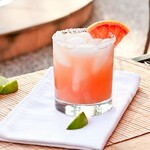 Love grapefruits, adore margaritas, so this is bound to be a winner! Thanks! Margs are my favorite and I recently discovered the joy of grapefruits. Oh, these will be made this weekend for sure! how can i make a virgin grapefruit margarita? @Caitlyn, I wouldn’t call it a margarita, but I like to juice half a grapefruit and half a lime into a glass. I then add a few glugs of club soda and sweeten with a splash of simple syrup. The grapefruit and lime come through nicely and it’s very refreshing! I whipped up a big batch of these for my husband’s birthday party a few weeks ago and they were so, so good! The only change we made was to score a Habanero pepper and leave it in the tequila bottle for 24 hours prior. We love spicy cocktails and the heat from the pepper was a perfect combination with the tart, refreshing flavors of grapefruit and lime. All of our friends declared these the best homemade margaritas ever! Oh wow!!! Inspired by your Cinco de Mayo post, I set out to make these tonight…and was convinced by the nice guys at the ABC store to buy Agave Nectar instead of simple syrup…other than that, followed your recipe exactly (including the Rio Star Grapefruit) and it is simply divine!! Thanks for sharing yet another fabulous recipe! I am so intrigued by using grapefruits for my fav cocktail. I’m having girlfriends over on the weekend and can’t wait to try this! Delicious recipe. Best margarita i’ ve had. My husband loved them. Thanks! Can you make this blended? Hey guys! It’s Diana from Food Blog Camp. You’re food photography is looking great, this photo caught my eye on Pinterest. I actually just tried the Texas Rio grapefruit last week. I didn’t like grapefruit for the longest time, but this one made me a convert. It’s so sweet and tart with no bitter aftertaste. LOVE it! So I shared this one my blog and I finally made it tonight. ? Phew, the tequila crept out of nowhere and whispered sweet nothings in my ear. Very nice. I think I’ll keep this drink on standby. Thanks for sharing. shared on* my blog (sorry for the typo… tipsy typing). My cheeks are burning and my mouth is watering at the mere thought of this drink. Definitely a Margarita kinda day. Thanks for the recipe. I am now a margarita snob, thanks to your fabulous recipe. I LOVE margaritas, but finding a recipe I really like has been difficult. Most recipes are too sweet or too strong. My previous favorite margarita was the blue margaritas from the tequila factory (Its not really a tequila factory. I am unsure why it’s named a factor…) at Cozumel Mexico. However, this recipe for Grapefruit margaritas is now my true favorite. Especially during Grapefruit season, here in Florida. Thanks so much for sharing…Now I need to get a better juicer so it won’t take so long to juice all that wonderful citrus.